EUGENE, Ore. (AP) Oregon running back Royce Freeman, quarterback Justin Herbert and receiver Dillon Mitchell all left in the first half against California on Saturday night. Herbert left at the end of the first quarter after a 7-yard touchdown run. 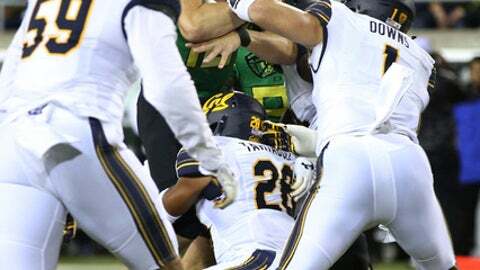 He had thrown a touchdown pass as Oregon built a 17-0 lead against the Golden Bears. Mitchell was injured in a collision with a teammate on an early punt return. He returned to the game only to leave again. All three players were listed as questionable for a return to the game. Freeman had already run for 51 yards when he was injured. The senior has rushed for 541 yards and an NCAA-leading 10 rushing touchdowns this season. Freeman ranks ninth nationally with an average of 135.25 yards a game. Mitchell was the Ducks’ top receiver with 18 catches for 217 yards and two touchdowns going into the game. Oregon was already missing senior receiver Charles Nelson because of a right ankle sprain.